On June 3rd, Malo hosted its first Ultra Premium Tequila Tasting in its upstairs event space. For a mere $15, guests sampled from an outstanding selection of tequilas, including 4 Copas, Partida, Maestro Dobel, Comisario, Casa Noble, Hacienda de Chihuahua sotol, Tequila Ocho and Siete Leguas. The complimentary light fare and DJ were both greatly appreciated by the crowd, if the constantly-replenished food trays and lively dance floor were any indication. Upon entering the first room I was greeted by Maestro Dobel, “the first-ever diamond tequila.” Its crystal clarity and extremely limited availability certainly justify the tagline. Clarity – the result of a proprietary filtering technique. Crispness – from the lowlands where the hand-selected agave plants are grown. Complexity – derived from a blend of reposado (rested 15 months), añejo (rested 24 months), and extra-añejo (rested 36 months) tequilas. 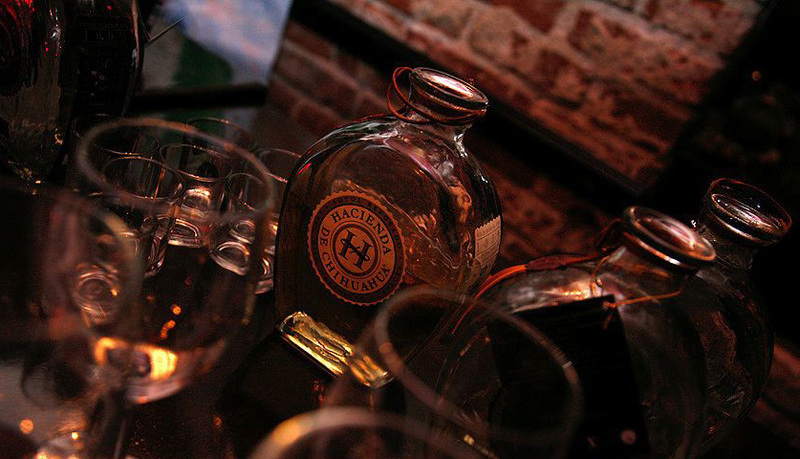 Craftmanship – a nod to the Tequila Maestros who create each small batch (check the handwritten notes on each bottle). Maestro Dobel was the perfect tequila to start my tasting journey; incredibly clean and smooth, full-bodied and multi-layered. There are strong flavors of oak and dried fruit, as well as pepper and honey. It’s truly a great sipping tequila, though I’m sure it would be enjoyable in a classic margarita or similar “clean” cocktail. Nearby was 4 Copas, “the world’s only organically certified tequila.” 4 Copas is featured on cocktail menus throughout the city (including Malo, Akasha, Cameo Bar, Locanda del Lago, and more) and figures prominently in those that emphasize fresh, locally sourced ingredients. The añejo in particular was exceptional, its oak barrel aging process yielding notes of vanilla, citrus, and lingering smokiness. In the other room, two booths in particular were drawing a great deal of attention. First up was Tequila Ocho, where Brand Ambassador Scott Haro took great care to make sure guests did the proper tasting progression from plata to reposado to añejo. Scott explained that Tequila Ocho is on a mission to demonstrate, through its Single Estate Vintages, that “terroir” exists in agave. Each estate (“rancho”) produces a limited amount of agave, thus each vintage of Ocho is limited, as designated by the hand-numbered bottles. Of the three excellent 2008’s, the El Carrizal Reposado stood out, with an initial floral nose that opened up to vanilla and fruit notes. Next to Scott was the Partida booth, and none other than Damian Windsor (The Roger Room, The Edison, Bar Lubitsch, etc) was shaking up margaritas and pouring samples. Guests seemed more interested in the margaritas than learning about Partida, but that’s to be expected when one of L.A.’s top bartenders is mixing free drinks. Even though it was her birthday, Malo Beverage Director Christine D’Abrosca was busy clearing tables and checking on the booths. You have to respect someone who will work her own birthday party in order to make sure her guests were enjoying themselves. Many thanks to Christine and the Malo crew for putting together such an enjoyable and educational event.